Every day at the Forestgarden we gather quantities of truffle from the local regions and other selected truffle-bearing zones in Greece and we immediately separate them according to their quality. This selection is made based on size, degree of maturity, shape and aroma; we firstly select those that are the most suitable for distribution and immediate consumption while fresh in restaurants or retail. 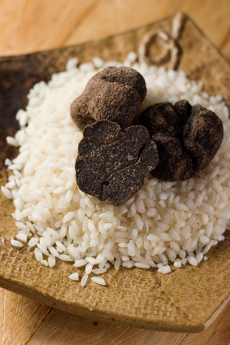 The amount of truffles of this prime quality are rarely over 15-20% of the total quantity gathered, as they have to meet an array of specific standards. For example, the truffles must have a smooth shape in order to be able to provide a shapely fillet to decorate the plate. They also must lack marks from the claws of truffle dogs or instruments used for their collection, which besides harming their appearance, also aggravates their preserving. The remaining truffles, which are the largest percentage, are divided according to shape and maturity, and then are immediately processed so as to be used in appropriate products. Some of them are dried, others are sliced or crumbed, and the most matured ones are puréed. Our experience combined with the above reasons allow us to be able to guarantee fresh truffles of prime quality at the best market prices. 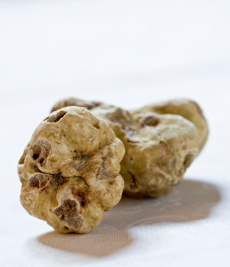 Commonly named ‘white truffle’, it is mainly found in Alba, Italy, but also in Molise, Umbria, Tuscany. In Greece it is usually found in the Epirus region. Croatia also boasts of its production, and it can be found in smaller numbers in Romania and Bulgaria. Season: white truffles grow from mid-summer up to the end of December. The best time of year to taste them is from mid-October to the end of December. 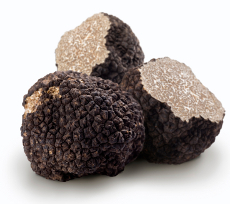 Commonly known as ‘black truffle’ or Périgord truffle. In Greece, its culinary value was known and was used widely since ancient times. Season: black truffles thrive from early December (early frosty weather) up to the end of February. Also known as Bianchetto spring truffle or ‘whitish truffle’. Season: From January up to April. 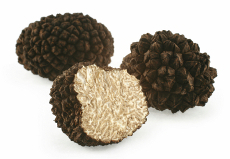 Commonly known as ‘summer truffle’ or ‘burgundy truffle’. Season: From mid-May up to end of August. It is commonly found all over Greece, where it thrives due to the warm climate and sunshine, which are highly important factors to its growth, as it is clearly a Mediterranean variety. It can also be found in northern climates (mid-summer season), but its aroma is of lesser quality. Also known as ‘autumn truffle’. Many confuse this variety with the summer truffle (in Italy there are places where the two varieties share the same name: “scorzone”). 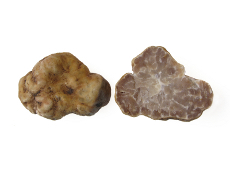 The mistake is common, as once the summer truffle season comes to an end (in August), the autumn variety begins to thrive in altitudes of 800m or higher. Even specialists will have trouble finding differences in aroma or shape at that time. However, at the end of September, when Uncinatum has fully matured, we can discern its strong aroma and its bold pyramid-shape faceted peridium. One could say that this is the ‘winter version’ of the Aestivum. Season: End of August up to mid-December. Comparable to Uncinatum, but with a smooth peridium without bold facets, its common name is exactly that: ‘smooth black truffle’. Its color on the inside is dark brown with reddish tones. It is mostly found in northern climates. Season: September to end of December.